Casinopolis is a Casino-themed Action Stage in Sonic Adventure. It is modeled heavily after Sonic 2's Casino Night Zone with a similar color scheme. It contains typical casino gimmicks such as a solid gold Sonic statue and a life-size pirate ship mockup. The main casino area is circular with a dome roof. The zone is located in Station Square, in the area accessible from the hotel and station. Opening Casinopolis' entrance is achieved by pressing the large button above the door. Sonic achieves this by pressing a button to activate a line of rings to the button and performing a Light-Speed Dash along them, while Tails simply flies up to the button, and Knuckles climbs up a nearby wall and glides to the button. The images of the characters on the slots use the character designs from past games. Sonic and Tails arrive here to locate the grey Chaos Emerald in their race against Eggman for the Emeralds, while Knuckles searches the casino for Master Emerald shards. The aim of Sonic's level is to reach a platform in the Ring Vault. This platform is high enough that Sonic cannot reach it by normal means, and it's blocked off by an invisible barrier until the vault has 400 rings anyway. By stepping on a button in the vault, a mechanical grabber will grab Sonic and shake out all his collected rings onto the vault floor, eventually rising high enough to provide a step up to the platform. 400 rings are required to reach the platform. Additional rings can be collected and deposited, which will be used to help create a Sonic statue in the center of the stage lobby. The Sonic pinball table awards the player with a ring whenever a target is hit, and with a number of rings for completing target combinations. There is a sub-area where it is possible to control Sonic over a rotating bridge and into some ring monitors, though this can be difficult and wastes time. There is also a slot machine target which activates slots that are stopped one-by-one by pressing . Getting a line of a certain character or item horizontally or diagonally gains (or loses, in the case of Eggman) rings, disables the slot machine for a set period, and typically activates a block to avoid losing a ball for the same amount of time. In addition, triggering these combinations usually sets a challenge during that time to get the ball to pass through a part of the table or hit certain obstacles on the table, which upon completion will give an additional ring bonus. The NiGHTS pinball table marks the first instance of a NiGHTS cameo in newer Sonic games. On the pinball table are cards in the design of NiGHTS characters which the player collects by hitting them. Once collected, the card is shortly replaced by a different one. After collecting five cards, the game distributes rings if 2, 3, 4 or 5 of the same card (or a Full House or similar Poker hands) have been collected. A 'higher' area of the table, called the Nightmare table, can also be played. This table is in a mostly-open setting with many cards. However, it is very easy to waste time on the table, with a long NiGHTS flying sequences the player must endure when traveling from the Nightmare table, and another to grab an Ideya. A short Nightopia sequence plays if the ball lands in the gutter in the Reala room, whereupon any collected Ideya will be deposited. Collecting all the Ideya will give the player a bonus of 300 rings. Tails racing Sonic in Dilapidated Way. 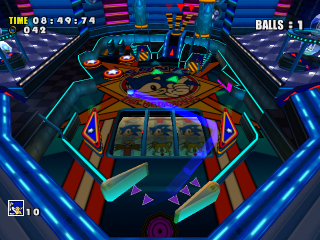 If the player loses all three balls on either pinball table while having less than 100 Rings, they are deposited in a new area called Dilapidated Way. This area is a sewer filled with spinner enemies and spiked balls. This can actually be the quickest way to collect rings, as it is possible to pass through around 35 10-ring monitors and collect 350 rings on a single run through the area. However, it is also very easy to lose all rings collected due to the many traps. Striking the coin gambling machines on the outer edge of the main casino makes them deposit a small number of rings in a circle. Depending on the number of times these machines are struck, they will fist yield seven rings, then three rings, and then one ring. These rings behave as rings do after the player is attacked by an enemy, and disappear after a short time. After three hits, the coin gambling machines yield no more rings. Each shower in the shower area (where the player re-enters the Casino from Dilapidated Way) contains one ring. 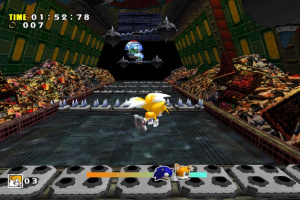 Casinopolis is unique among Sonic's Action Stages due to its non-linear design. While one section, Dilapidated Way, takes the form of a standard linear stage, this section is entirely optional and may be traversed any number of times. Sonic's version of Casinopolis is also the only Action Stage in the entire game where there is no fixed order in which the individual "acts" must be played. Sonic takes a moment to clean himself off after running through the sewers below. Tails' level is a race against Sonic through Dilapidated Way. The multiple routes through the level cause the progress icons at the bottom of the screen to often jump back and forth, making it hard to know who is ahead. There is a vent on the right wall at the beginning of the stage and it would be assumed that is from where Sonic and Tails entered the area. However, they are seen falling down from the ceiling. Knuckles' aim is to collect three Master Emerald fragments in an extended Casino area. All the areas in Sonic's Casino area are available, and springs dotted around the area launch Knuckles into an upper level, which contains a moving lion sculpture, a pirate ship montage, and access to an inner-workings area above the entrance to the vault. Spinners are common in Knuckles' level, with a swarm of them in the entrance to the vault and one in each shower. The Sonic statue in the center of the level can be smashed by punching a red-glowing crack in its foot. This can sometimes reveal an Emerald fragment hidden in the statue. There are some monitors on the ceiling, only visible once you fly to the first floor, which show two real-life photos of the Fremont and Sassy Sally's casinos. This page was last edited on 27 November 2018, at 11:40.